Until recently, Sutter Health had only a handful of walk-in retail clinics inside Rite Aid stores to complement its dozens of urgent care centers, which cater to patients with more serious ailments. But after talking with patients, Ted Matson, the system's vice president of strategy and business development, said it was clear that they wanted greater convenience and more options for getting care closer to home. “People wanted significantly more opportunities in the form of convenience, expanded access and hours,” Matson said. 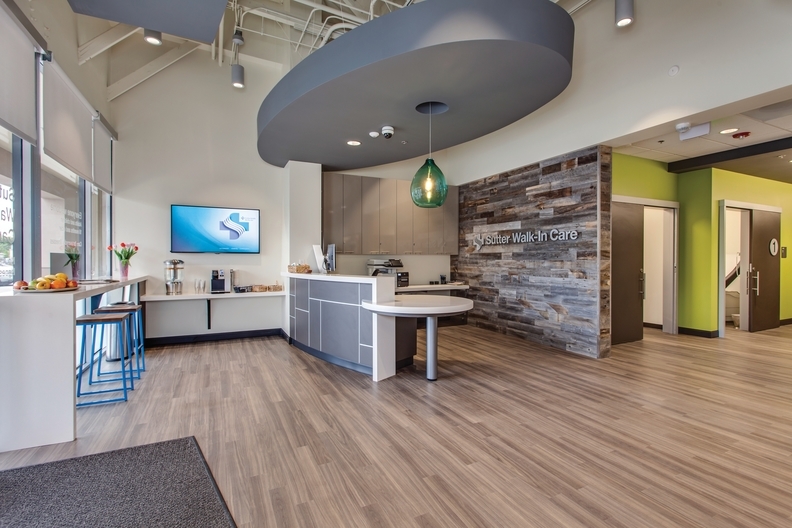 So last April, Sacramento-based Sutter opened three of its own walk-in clinics in neighborhood shopping complexes in the Sacramento area. It plans to open nine more in the Bay Area this summer. The independence from Rite Aid gives Sutter more flexibility to serve patients' needs. Nurse practitioners and physicians' assistants at the centers can care for minor illnesses like ear infections, or administer wellness screenings. They're open 12 hours a day, seven days a week. It's a low-cost option for patients, many of whom are now enrolled in high deductible health plans, Matson said. And it helps the system, too. By seeing patients that may otherwise have gone to an urgent care center or primary care office, the clinics free up appointment slots for patients who really need them, he said. Moreover, unlike the independent retail clinics offered by pharmacies and others, Sutter's clinics are integrated into its health system. That allows immediate follow up and referral to other providers if needed. The clinics will begin offering telehealth this spring so patients will be able to seek care from a clinician without leaving home. The 25-hospital system is one of the many traditional healthcare providers and hospitals that have begun giving patients more options for conveniently accessing healthcare in ways that today's American healthcare consumers demand. A handful of major providers such as Oakland, Calif.-based Kaiser Permanente, Renton, Wash.-based Providence Health & Services, and Rochester, Minn.-based Mayo Clinic are partnering with or opening their own retail health clinics to meet demand. Research firm Accenture estimates the number of retail clinics nationwide will reach 2,800 this year, up from 1,200 in 2010. A minority of retail clinics are owned by or operated in partnership with health systems and hospitals. Most are owned by pharmacy chains, such as CVS Health or Walgreen's. Some providers are establishing urgent care tracks within their offices by designating a clinician to take care of patients with immediate needs. Others save slots in their schedules to accommodate same-day appointments. A growing number are offering telehealth services as a way of appealing to the Netflix generation. It's all about finding “creative ways to be available and accessible to patients outside of traditional work hours,” said Dr. Lynne Lillie, a practicing family physician in Rochester, Minn., and a board member at the American Academy of Family Physicians. The systems moving aggressively into storefront retail medicine realize if they don't meet the demand, new competitors will. They face an onslaught of retail clinics and direct-to-consumer telehealth companies intent on snatching patients. They increasingly realize expanding their care delivery options and extending hours isn't just an added benefit for patients – it's necessary to maintain and build market share. “Many health systems are concerned about capturing a greater population,” said Steve Valentine, the vice president of strategic advisory services on the West Coast at Premier, a group purchasing organization and healthcare consulting company. They're looking for ways to expand access points for care and develop “stickiness” between the provider and patient that will help them keep their customers and pull in new ones, he said. The desire for convenience, along with a shortage of primary care doctors, has led to explosive growth in retail clinics. Today these medical clinics can be found in grocery and big-box stores like Walmart and Target as well as big pharmacy chains. They are offering their customers walk-in appointments, extended clinic hours and shorter wait times where patients with relatively minor ailments can see a doctor without a primary care appointment, which is usually unavailable on a same-day basis. Even more convenient that dropping by the local CVS, patients today can see a doctor without ever leaving their couch. They can log into one of the many direct-to-consumer telehealth platforms made available by start-up companies like Teladoc, American Well and Doctor on Demand, and within minutes get a prescription for a rash or an ear infection after chatting with a physician who may not even be in the same state. These virtual visits cost an average $40 to $50 – significantly below a primary care office visit or a trip to the emergency room. Some traditional providers and healthcare associations have raised concerns about the quality of care provided in retail clinics or delivered through a computer screen. They warn that these convenient care alternatives could lead to fragmented care, worse patient outcomes and higher costs if the patient's primary care physician is kept out of the loop. But several studies show some of these concerns are unfounded. A 2014 study published in the American Journal of Managed Care found that minor ailments treated in retail clinics inside CVS pharmacies received care that was equal to or better than care offered at ambulatory care facilities and emergency departments. While the jury is still out on how direct-to-consumer telehealth services for low-acuity care compares to face-to-face doctor visits, organizations like the AAFP support telehealth when used in the context of the medical home. Those concerns have not deterred patients. A February Accenture survey revealed that about 78% of consumers are interested in receiving virtual health services, but only 20% has had the opportunity. One reason telehealth has been slow to catch on is because many health insurers do not reimburse for virtual visits, Valentine said. But more are. As a result about 72% of hospitals and 52% of physician practices now use telehealth in some way, according to a 2016 survey by telehealth software startup Avizia. Greenville (S.C.) Health System launched a telehealth service last April to create more convenient access points for patients needing low-acuity health care. The health system was dealing with a shortage of capacity and patients faced long waits to see a doctor, said Blix Rice, vice president of innovation and transformation at the system's Care Coordination Institute. That drove patients to seek care from the costly emergency room for minor ailments, he said. So the eight-hospital system began offering a service called SmartExam by telehealth start-up Bright.md, which allows patients to log into the SmartExam platform and answer questions about their health history and symptoms. Based on that information, SmartExam develops a list of potential diagnoses and transmits the information to a nurse practitioner at GHS, who then reviews the patient's information, selects the appropriate diagnosis and confirms a treatment plan. The progress note from the encounter is incorporated into the patient's medical record. Unlike a face-to-face virtual visit, this type of telehealth encounter allows clinicians to respond to SmartExam visits in between their regular office appointments. The process takes five minutes, while a video visit could take 15 minutes, Rice said. Using the SmartExam system allows GHS to see between 20 and 25 patients a week without needing to hire additional staff. Patients are happy because the visits cost just $20. “The growth in retail-based healthcare has (provided) real tangible evidence of the fact that people are needing more access to care,” Rice said.